ProMAX Panel, Material For Modular Sound Isolation from Auralex. Auralex introduces its new ProMAX Panels stand-mounted, portable StudioFoam absorbers at Winter NAMM 2012 (Hall A, Booth 6798). Auralex’s new ProMAX panels are designed as a portable absorption treatment for such run-and-gun recording and performance applications as studio rentals, live events and temporary recording. They can be used in any location where mounting acoustical treatments to the wall are not possible or ideal. The flexible absorption panels are simple to set up and transport and easily assembled and disassembled for convenient storage. Their lightweight and flexible design makes them ideal portable absorbers, as they can be moved easily and positioned to reduce audible reflections in any recording or listening environment. 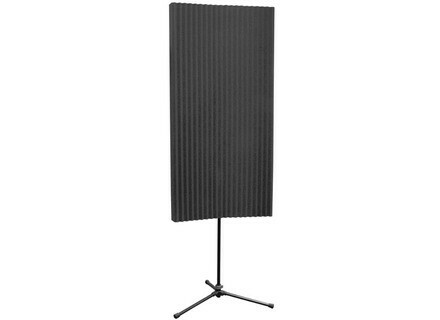 Auralex ProMAX Panels can also be grouped together to form a portable vocal booth on the fly. They can also be positioned around a drum kit to “tune” room sounds in recordings and live performance venues. Able to be extended up to eight feet high, Auralex ProMAX Panels feature an adjustable contour for precision positioning. Visit the Auralex Web site for more details: www.auralex.com. [NAMM] Sustain Bamboo Sound Diffusor Series Auralex launched a line of acoustical products made from bamboo, the Sustain Bamboo Sound Diffusor Series, at Winter NAMM 2011 (Booth 6698, Hall A). [NAMM] Auralex Sono Lite Auralex will introduce another addition to its line of products at Winter NAMM 2011 (Booth 6698, Hall A); the SonoLite fabric wrapped Studiofoam Pro panel. Vicoustic Super Bass Extreme Trap Following the recent release of its stand-alone, tunable Vari Bass, acoustic solutions manufacturer Vicoustic has turned its attention to a more permanent solution for addressing low frequency issues.